From distant galaxies in the far-flung future, to ancient history on the planet Earth, Doctor Who is unique for the breadth of imaginative possibilities it offers the artists charged with bringing each episode to life. Mining the depths of the BBC archives, Stephen Nicholas and Mike Tucker have compiled this breathtaking collection of rare and never-before-published images that are interwoven with fascinating insights from the show's writers. Showcasing the work of Doctor Who's remarkable designers, Doctor Who: Impossible Worlds pays tribute to the care and attention to detail essential to creating the look of the show, from the characters themselves-including recurring villains like the Daleks or the Cybermen-to the smallest hand prop featured in the briefest of scenes, to the TARDIS console room and other regularly used sets. Doctor Who: Impossible Worlds explores how the art department works together with costumers and make-up and special effects artists to produce a coherent look for a diverse range of alien worlds; reveals how the artists' relationship with the computer graphics department allows them to create locations far grander than possible in the real world; and shows how today's creative artists have built upon the designs produced by their predecessors-the pioneers of the program's "classic" era whose legacy has delighted audiences since 1963. Divided thematically, Doctor Who: Impossible Worlds examines the history of the program and its art and set design, and highlights how various re-occurring designs have evolved over time. 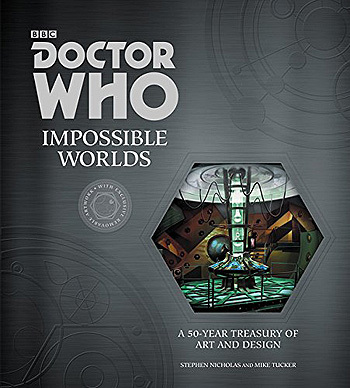 Chock full of surprising, illuminating, and fascinating information, photographs, and trivia, Doctor Who: Impossible Worlds is essential for every Whovian, whether you're an established fan or are new to the show.